On Saturday, Mary asks me, “Who was VAFB named after?”. Excellent question. Let’s ask Wikipedia. Vandenberg AFB is located 9.2 miles northwest of the town of Lompoc, CA in California’s central coast. The base is named in honor of former Air Force Chief of Staff General Hoyt S. Vandenberg. VAFB is the home of the 30th Space Wing, US Space Command. During WWII, Gen Vandenberg was commanding general of the Ninth Air Force which was a tactical force in England and France. Vandenberg grew up in Lowell, MA. (Hey, I know where that is) and graduated from the US Military Academy in 1923. The Vandenberg Esplanade, located along the Merrimack River in Lowell, Massachusetts and part of the Lowell Heritage State Park, is named in his honor. 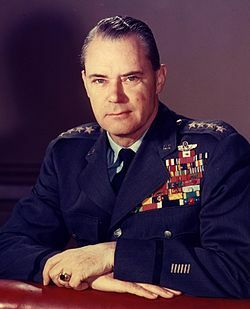 General Vandenberg was awarded the Distinguished Service Medal with one oak leaf cluster, the Silver Star, the Legion of Merit, the Distinguished Flying Cross, the Air Medalwith four oak leaf clusters, the Bronze Star, the World War II Victory Medal, the American Campaign Medal, the American Defense Service Medal, and the European-African-Middle East Campaign Medal. Here’s a map of VAFB for those who might be California challenged. This entry was posted on September 14, 2015 at 12:50 am and is filed under Air Force, California. You can subscribe via RSS 2.0 feed to this post's comments.